First I’d like to thank everyone for their comments, prayers, and support yesterday for my husband’s hand surgery. The surgery went well and and he is home resting. Your kind comments really made me feel better! Today I received The Spreader of Love Award from my friend Riet at Quilt n' Stitching Lady. Riet lives in the Netherlands. I am fairly sure our paths have crossed before I started blogging when I was more involved in cross-stitching. She loves quilting , cross stitching, reading, shabby chic, old mirrors, and decorating. Take a few minutes and visit her blog when you have the time! This blog has been awarded The Spreader of Love Award created by The Love Blog, for an outstanding demonstration of blogging love. Nominate as many blogs you want to! Thank you all for inspiring me with your blogs! It’s time for “Outdoor Wednesday”. What is “Outdoor Wednesday”? 1. POST- Post your outdoor photos and the Outdoor Wednesday logo/button on your blog and link back to A Southern Daydreamer (link) so that others will be able to find all the links to other Outdoor Wednesday posts. 3. LINK NAME & PERMALINK- Enter your name and the Permalink to your post (NOT your general blog address) in “Mr Linky”. Copy your permalink into “Mr Linky” URL box next to your name and select ENTER. You are finished. You should see your name listed on my site. On Wednesday morning as many of you are waking up I will be sitting in a hospital waiting room waiting for my husband who will be having outpatient hand surgery. It isn’t major……but he is still my best friend…. and I don’t look forward to see him suffer and in pain. I hope we are home by mid-day and I can sit at my laptop and watch him sleep nearby. I wasn’t sure what to post for this week’s Outdoor Wednesday. It has been dreary and rainy lately and the lack of sunshine has certainly been noticed by ME! I walked out onto our deck today and sighed….it was still overcast and no sign of the sun. Out of the corner of my eye I thought I saw something….some color! What? When I bought this tree over ten years ago it was tagged a cherry tree. I soon discovered it was a flowering plum tree. I couldn’t believe my eyes today when I saw it was beginning to bloom! I had to go get my camera and get a few pictures! Some pictures I took last year on a sunny day. This tree has beautiful bark and beautiful blooms. I will try to take some more pictures over the next few days. Hopefully we won’t have a heavy rain or windy day which would whisk away my beautiful blooms. I know, it’s a silly tree….. but the signs of spring were what I needed today! It’s Tuesday which means it is time for Tablescape Tuesday hosted by Susan and her blog Between Naps on the Porch. I realized I haven’t used my every day Blue Willow dishes in a tablescape, so I thought I would use them this week. Here is the place setting. I never get tired of these dishes. I am glad I have been using my silver more often…what was I saving it for all these years? 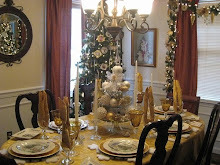 Thanks for stopping by and visiting my Tablescape Tuesday and don't forget to visit Susan's blog Between Naps on the Porch to see more wonderful table settings! Reminder: Tomorrow is “Outdoor Wednesday”! (Post will be up by 11:00 pm EST Tuesday night). To Learn More about Outdoor Wednesday, click on the button below! It’s time for Blue Monday hosted by Sally at Smiling Sally. Don’t forget to visit her site to see links to more participants! Today I am going to share……. blue flowers…… These aren’t in my yard (I wish). I have been browsing through plant catalogs lately…. while waiting for spring! “How long did it take you to finish?” (Blue Needlework in Blue Monday post) from envoy-ette at It Could be Worse, Claudie at Claudie’s Blog, Diane at Four Paws & Co, Sheila at Quintessential Magpie, and Wendy at Some of my Favorite Things- I don’t remember exactly…guessing three months. I always had more than one project going at a time. “Is it a Martina Weber design?” (Blue Needlework in Blue Monday post) from Riet at Quilt n’ Stitching Lady and Susan at The Good Life– Yes, it is a Martina Weber/Chatelaine design. I have finished a few and started a few others. They are large projects! It is called “Watergarden”. Most cross-stitch shops have it or can get it. “How did you get your same background on Twitter, if you don't mind my asking?” from Debbie at Confessions of a Plate Addict- I don’t mind you asking! You can change background in Twitter by going to settings>design>change background design…. My background isn’t the same (exactly).. I took an image of a portion of my background and then selected “tile” to have it repeat it.. Looks the same…but it isn’t! Even with the chip, I love the details…and a family treasure for the cousin who now owns it! I recently decided to “collect” dishes and I try to add to the ones I have when I can. Most of the dishes I have are blue/white but I may have to add a few pink. Here are some pretty pink dishes that I like…..aren’t they beautiful? I had a couple people ask about how I organized my blog…. specifically “My Blog List” and “Awards” …. After I created the blog… I set the background and fonts all the same, so that if you moved form the front page of my regular blog to a page in the “extras” blog it wouldn’t be obvious. I’ll use my most recent one as an example. I wanted to place all the weekly blog posts in one place (are they called memes or carnivals? I don’t know… like I said I am new to blogging) . First, I posted them first on my “extras” blog in a regular post. Then, I pulled up the “add a gadget” (in layouts) in my regular blog and selected “picture” gadget and put the link to the post in …. and added in the title box “Click below to see weekly posts” and then browsed on my computer to select an image to use as the “button” (I made all the little images). Don’t forget to hit save. After the gadget is saved you can drag it where you want it on the layout of the page. That’s it! When you click on the image it will go to the post! The award list is simply a post on the “extras” blog that I can pull up and edit any time I want to add or change anything…. just like you would any other blog post and then hit publish. It will post again on same day and post. Does this make any sense? (Not sure I am explaining it well enough) I’ll try to answer any questions you might have (just leave a comment). I am still new at this and learning as I go…. and happy to share what I do learn….. just ask! What do you think of my “Weekly Blog Posts” page? Name might not be right and I may change it… and I am sure I will add more “weeklies” to the list! Have any other questions? If I don’t know, I can Google it and try to figure it out! I have been blogging a little more than a month and this week I received three awards! I am honored and humbled. Thank you ladies for the awards! I received the Sisterhood Award from Teri at The Boosalis Bloggle. Thank you Teri! Teri started blogging last summer and I “met” her my second week of blogging. Stop by her blog sometime and say hello! It is always hard to select who to give an award. The rules state 10 blogs… so I am going to give this award to 10 bloggers who have commented 10 or more times on my blog… whom I have not yet given an award. Thank you ladies for reading my blog and taking the time to comment. You are appreciated! I also received the Friends Award from Charlotte at Charlotte's Weblog . Thank you Charlotte! Charlotte has been blogging over a year. In addition to her blog, Charlotte's Weblog, she also has the following blogs: At Home in Scottsdale, Dolls, Dolls, Dolls, and Spiritual Sundays. Stop by and say hi to Charlotte! And last, but not least, I received the You are Truly Beautiful Award from Ann at Life at Ann's Place. Ann has been blogging almost a year since November 2008 (Thanks Gloria). I met her my first week blogging. She is very sweet and makes me laugh out loud (often). Visit her blog when you get a chance! Find the beautiful ladies that you follow. Hopefully it'll truly mean something to each and everyone of you. Don't be shy to give it to the same person! Don't forget to tell them! I would like everyone who reads and comments on my blog to have this award…for without you.. I would be blogging to myself! You are ALL beautiful to me! This week I am going to share the artwork of a local artist, Joy Hulgan. I had the opportunity to get to know one of her sisters when our sons played soccer together over fifteen years ago. All the sketches we purchased were of places that were sentimental to us. Thanks for visiting my blog. Visit Tam at The Gypsy’s Corner. for more Three or More Thursday participants. Today is “Outdoor Wednesday”. What is “Outdoor Wednesday”? 3. LINK NAME & PERMALINK- Go to A Southern Daydreamer and enter your name and the Permalink to your post (NOT your general blog address) in “Mr Linky”. Last Saturday we went to the annual family reunion for my father-in-law’s family. My father-in-law is the oldest of seven (yes, seven) children, so it is a rather large family. It was great getting a chance to see everyone. Before we went, I asked my father-in-law if he wouldn’t mind showing me some of his childhood places before we left town to return home (of course, he said yes!). I am not sure who was more excited…me or him )I love family history and wish I could visit all the homes of my ancestors. We visited cemeteries and neighborhoods. Of course I took many pictures. (Don’t worry, I am going to share only a few). The first photo is where the house stood that my father-in-law was born 87 years ago (to the left of the pine tree and in front of the pecan tree). Next, a picture of my father-in-law’s grandfather’s house. He lived from 1863 to 1946, mostly in this house. No one lives in the house now, but the land is still owned by the family. The kitchen was in a separate building in the back (and has fallen down). It was separate from the main house, so that if there was a fire, the entire house wouldn’t be lost. I love old buildings like this. Finally, a picture of an old oak tree next to the house. When I went to move Mr. Rooster and Mrs. Chicken from the center of the kitchen table I was asked, “Can’t you change the table and let them stay another week?” So if the table looks similar to last weeks Tablescape Tuesday …. yes..it is similar…but different! For the place settings I used my square Tuscan sunflower plates. The sunflowers go well with the one at the base of Mr. Rooster….. I love the big sunflower on the salad plate…..
and the four little sunflowers in the corners of the dinner plates….. Reminder: Wednesday is “Outdoor Wednesday”! (Post will be up by 11:00 pm EST Tuesday night). To Learn More about Outdoor Wednesday, click on the button below! Tablescape Tuesday – Winter Blues?